The 4th Qtr. 2015 NYCentral Modeler is Here!! In this issue you will find a humorous, but informative article by New Zealander, Phil Darkins, on building a resin kit. This is Phil’s second article for us and he promises another article about painting the resin kit in our next edition. 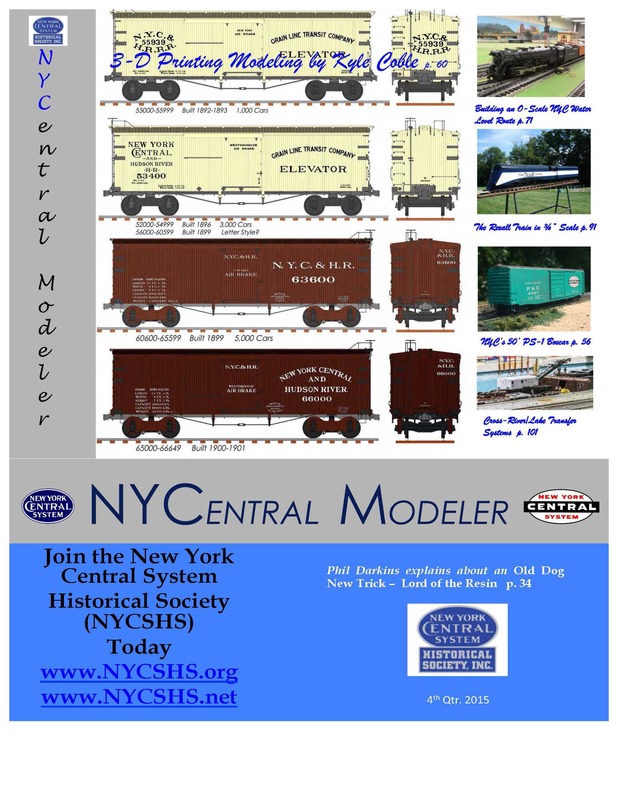 Seth Lakin returns with details about building one of the NYC’s 50′ PS-1 boxcars. Kyle Coble returns with his “The Early Car Shop” feature this time using 3-D printing to build us a 35′ standard boxcar pair. Bob Shaw continues to provide us with the details of how he is “Building an O-scale NYC Water Level Route”. Steve Bratina shares his experiences with another 3/4″-scale locomotive. This time it is the “Rexall Train Loco”. And finally, George Reineke returns with his long article on “Modeling Cross-River/Lake Transfer Systems. Of course, you will also find our regular features: “What’s New”, “NYCSHS RPO” and “The Observation Car”.